Nancy Remsen shakes Gov. 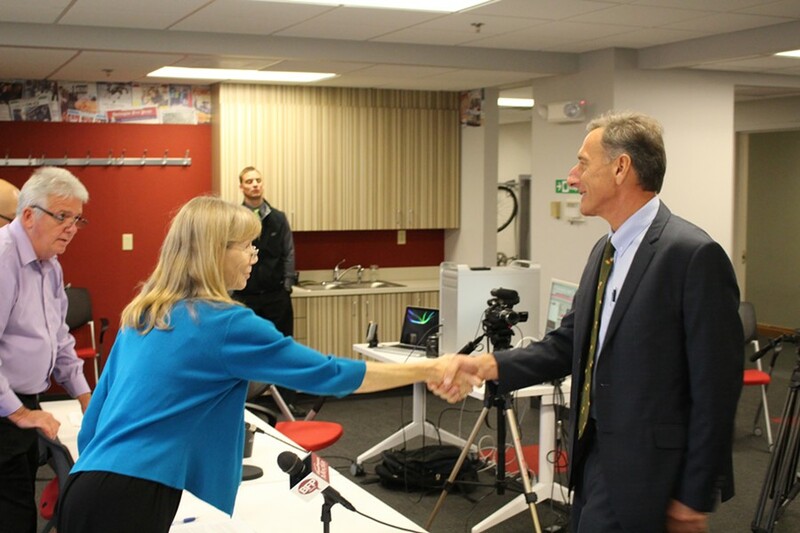 Peter Shumlin's hand last month before the Burlington Free Press' gubernatorial debate. Updated below with comments from Remsen and Hallenbeck. Nancy Remsen and Terri Hallenbeck, who make up the Burlington Free Press' two-person Statehouse bureau, are leaving the paper, according to sources close to the situation. The circumstances surrounding the departures are not entirely clear, nor is their timing. Both reporters filed stories in Tuesday's Free Press and would normally helm the paper's election night coverage. Last month, all but four Free Press reporters and editors were required to apply for new jobs at the paper with different responsibilities as part of a restructuring mandated by corporate owner Gannett Company, Inc. According to one source, Remsen and Hallenbeck were informed last Thursday they had been transferred from the Statehouse bureau to new positions covering community news. Both declined. It's unclear whether the paper will maintain a presence in the Statehouse. Tim Johnson, a 16-year veteran of the Free Press who was laid off last Thursday, told Seven Days on Saturday, “There’s not going to be a city hall beat. There’s not going to be a Statehouse beat. There’s not going to be an education beat." According to her Free Press bio, Remsen previously reported for the Associated Press and spent 20 years at the Bangor Daily News. She moved to Vermont in 1995. Hallenbeck began reporting in 1986, working in upstate New York before moving to Vermont in 1998. Reached Monday evening, neither Remsen nor Hallenbeck would discuss their employment status. "I'm not talking about it," Hallenbeck said. "It's not something I can say anything about," Remsen said. Not including Remsen and Hallenbeck, the Free Press has eliminated four of its 28 editorial positions through layoffs and departures in the past three months. Free Press executive editor Mike Townsend has repeatedly refused to comment on changes at the paper. Remsen and Hallenbeck confirmed their departures later Tuesday on their Facebook pages. Tomorrow will end 40 years of reporting for daily newspapers in Maine and Vermont. It has been a great run that is ending a little earlier than I wanted — but so be it. Ready for a new chapter. Any suggestions? Today, I am covering my last election for the Burlington Free Press. Later this week, for the first time since 1986, I will no longer be employed at a daily newspaper. I can assure you there is nothing easy about this for me. This was not just a job for me, but a lifestyle. Being a journalist is as much a part of me as my red hair and freckles. It is where I met my husband. It is a profession I have been unable to shake despite the bad hours, relatively low pay and obvious signs in recent years of the industry’s decline. This chapter of it, at least, is over though. I have opted against staying at the Burlington Free Press. Some of you may have heard that the Free Press and all Gannett newspapers rewrote all newsroom job descriptions and required employees to apply for the new jobs, which focus on pursuing the most popular stories as measured by website clicks. That no longer seems to include many of the stories I’ve had the pleasure of covering the last 10 years as a Statehouse/political reporter at the Free Press. It breaks my journalistic heart, but I can no longer pretend it’s not happening. It has been a great privilege for me to have a front-row seat to Vermont’s unfolding history. I’m thankful for all the readers who let my words share their breakfast table. I’m grateful to all the people who trusted me with their stories. I know there were times I disappointed you. There were times I disappointed me too, but I never took this special job for granted. There is significant irony in the fact that my departure comes during election week. You might think stories about elections, candidates and issues are important, but those stories typically attract far fewer web hits than stories about the latest crime, caper or car crash. Newspapers are now armed with data that make this crystal clear. As some of you know, my departure from the Free Press is not the only one this week or this year. This newspaper, like many, has bid premature goodbyes to all too many good people. The Internet has not only turned news stories into click bait, it has led people to believe they can obtain their news free of charge. If we believe that, we will get the world we are asking for – one that is less well-informed, less open to hearing new ideas from new angles. My soon-to-be-former colleagues, including my husband, will continue to try to do good work as they strive to make sense of their new world order. I wish them nothing but the best. I leave the Free Press without knowing my next step. That is unsettling, even scary. It’s time to take the next step, though. It’s time to see life from another angle.